Over the last couple of years I have spent a lot of time and energy coming up with aspirational recipes to share, recipes to channel my best self and to give ideas to maybe help you to do the same. I love this and still want to continue this journey trying to live and cook for my best life. 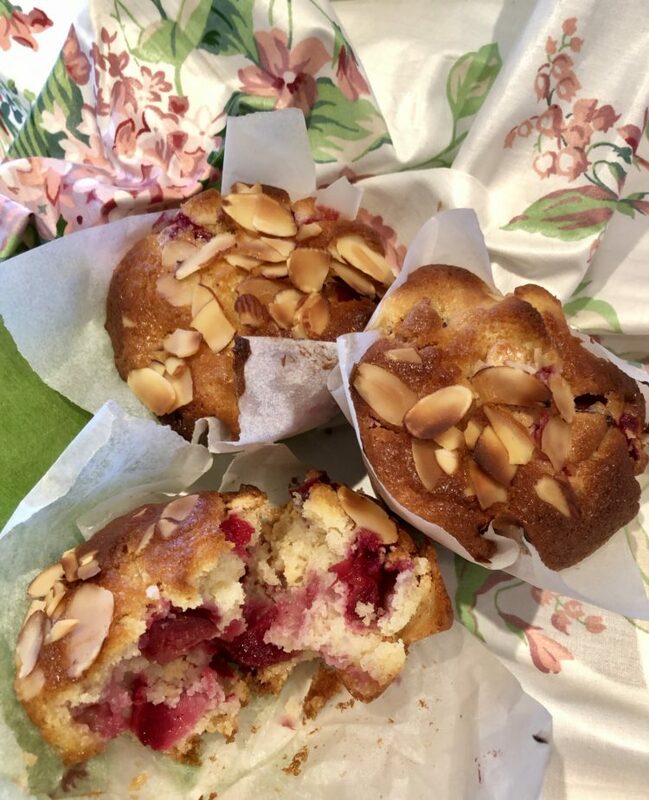 Moving on and a couple of weeks ago my son George sent a message from the other side of the world requesting a recipe for my muffins – I sent a quick recipe off the top of my head -forgot the sugar – doh…. Probably the best answer would be to think this through and put the recipe properly on the blog. The stumbling block with this idea comes from a feeling that for my best self no white sugar or flour should appear on this blog, and because of this I have always discounted the idea of recording some of these home favourites here Then over the last week or so I kept thinking about this and my reluctance to put the muffin recipe here on the blog. 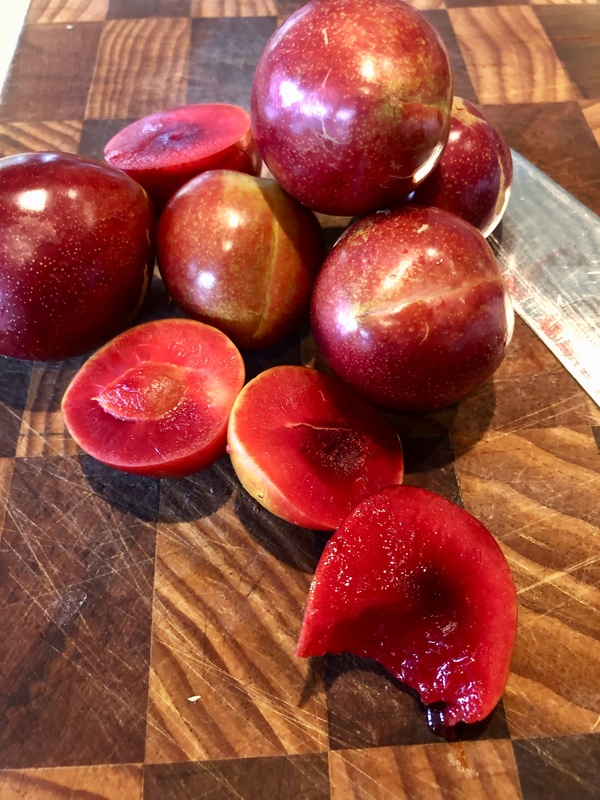 Lots of wondering has bought me back to my original reason for the blog which was principally was to keep in touch and share with friends and family at home and around the world – for me this means sharing my world as reflected in the kitchen. So it seems that something I have cooked so often that no recipe is required, is just the kind of thing should find a place here, both for you and for me. I have been cooking these muffins in various forms for the past twenty years at least. Soooo many fishermans lunches have left the house with these tucked away in a pack somewhere, as well as those given to friends, family and chickens. Over the years I have had many requests for the recipe – delicious as they might be I will always maintain that it is not the muffins themselves but the fact of being eaten in the great outdoors and more specifically on the edge of the “Amore” river (you will have to ask Ed about that one) and the charm of my lovey Ed helping us all to really appreciate and see the joys of lunch, life, and the world around us. 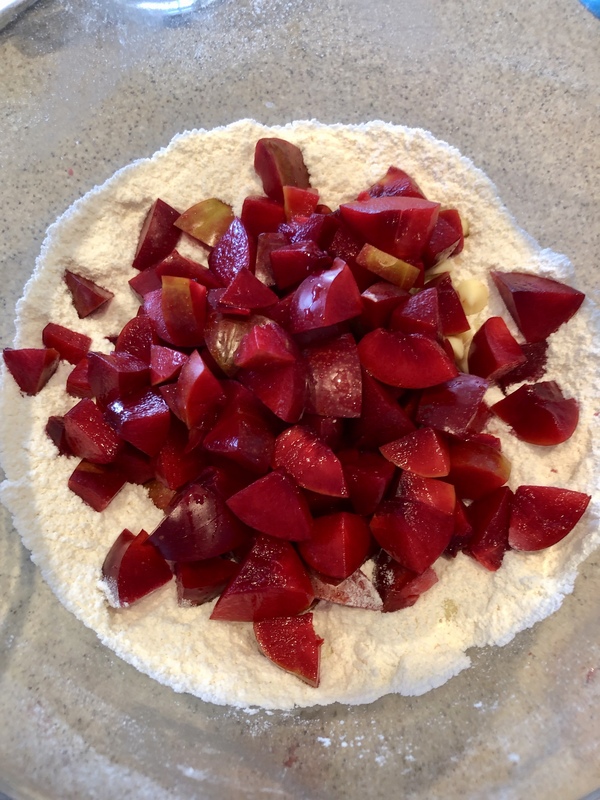 I definitely have resisted putting the recipe on this blog much to the bewilderment of many of those who have enjoyed them. Resisted on the grounds of white flour, white sugar shame. Having now found a place in my mind for these recipes on the blog I will leave it to you to look for the best quality flour and sugar you can, and hope that finally having shared this simple recipe you will give them a go and importantly let me know if the instructions aren’t clear. I think you need also to try and make sure you go for a walk and find somewhere beautiful to sit and eat them for maximum benefits. The charm for the cook of these muffins lies in their flexibility. 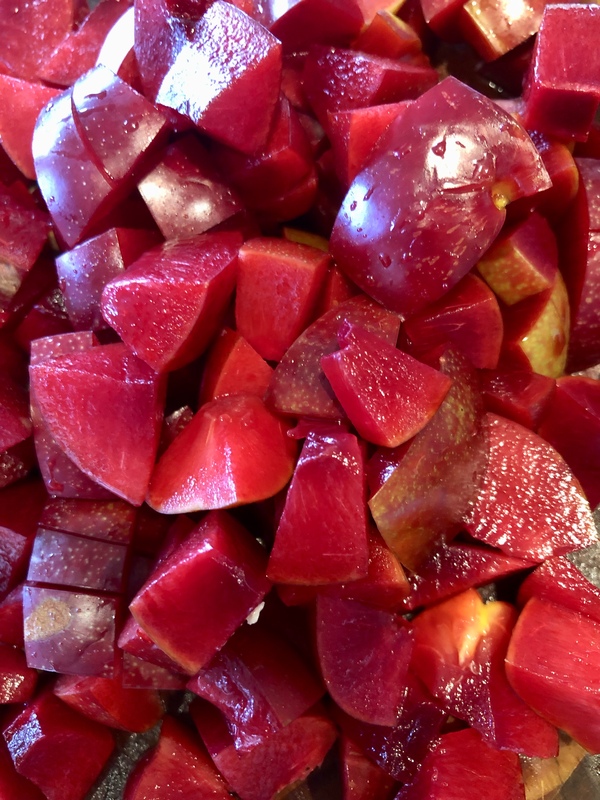 I use what ever fruit I have to hand, or from the freezer, eat some to test for sweetness! You can use a lightly flavoured oil such as avocado, macadamia, lightly flavoured olive oil…, or good quality butter, both will produce an equally delicious muffin, although I suspect those with butter are slightly richer tasting. You can also substitute other milks (soy, almond etc). Prepare muffin tins – grease well, use muffin cases or cut squares of baking paper to put muffin mix in to cook. Begin by melting the butter (if you are using it) in a jug or bowl large enough to hold the egg and milk as well. In a medium large bowl add the flour, sugar, baking powder and salt use a whisk or fork to blend these together. Chop the fruit if necessary and add with the white chocolate pieces to the dry ingredients and stir to blend. Add the egg to your butter or oil and whisk to combine then add the milk and whisk lightly to combine. Mix the wet ingredients to the dry and gently fold together until they are just combined – over mixing is said to make the muffins tough. You should have a slightly wet but not pourable mixture. My experience is that the muffins are best when the mix is wettish. Sprinkle over seeds or nuts if you are using. You can then put the mix in the tins or cases and will get approximately 6 or 7 large muffins (depending on the size of your muffin tins). Cook for approximately 40 minutes for large muffins. If you have smaller muffin tins and are making more muffins you will need to reduce the cooking time by 5-10 minutes. Leave to cool for five minutes before removing from the trays to firm up a little. The muffins can be eaten straight away but will keep well for a day or two. 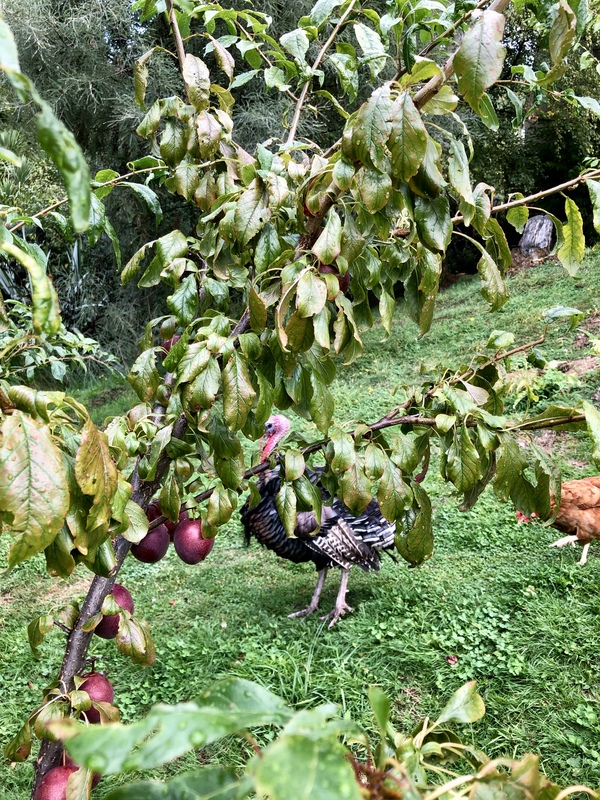 Colin the turkey is in the background keeping an eye me and making sure I don’t come to close to his flock of chickens.